Chicken is one of our favorite meals. This recipe below is an all-time favorite. So if you want to try something different with a flair, give yourself some time and enjoy trying a new dish with chicken. This takes a bit of time, but no last minute rushing around when company comes. Fry the bacon gently in a large flameproof casserole dish stirring for about 5 minutes until the fat runs. Take the bacon out and saute' chicken in the bacon drippings for about 5 minutes until golden. 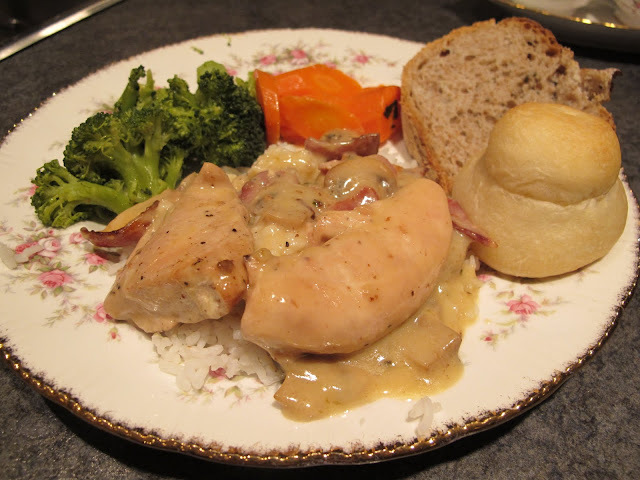 Set aside chicken into a casserole dish, reserving bacon drippings. In a separate skillet, melt the butter over medium heat and saute mushrooms. Add 1/2 cup white wine and stir at a low heat for 5 minutes. Set mushrooms and drippings aside, keeping warm. 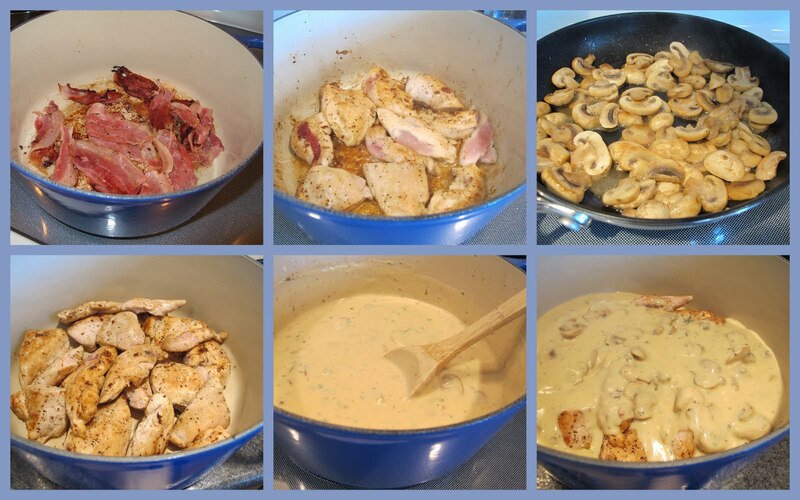 Add cream of chicken soup and cream of mushroom soup to the bacon/chicken drippings, making sure no lumps remain. Slowly add cream stirring constantly, then add remaining 1/2 cup wine, adjusting as needed to make a nice thick gravy consistency. Season with fresh rosemary and thyme. Toss the bacon that you saved on top of this sauce. Let mixture simmer over medium heat until bubbly and then add reserved mushroom mixture and stir together. Pour soup/mushroom mixture over chicken in casserole dish, cover and bake in preheated oven for 30-45 minutes at 375 degrees. Serve with your favorite pasta or on a platter of rice. Add a few fresh vegetables, zwieback and you'll feel like you are eating a traditional meal. Hmmmm... We love chicken at our house, too, so I like finding new ways to serve it. This looks delish! May I also say that I so appreciate the PDF option in the Print Friendly button? Makes saving the recipes here so convenient. I was fortunate enough to taste-test this recipe...at a nicely set table with good friends gathered around. Most delicious! Thanks, Marg. So tasty .. thanks for the recipe Marg. I will sure be making this one soon. Chicken is also one of our favorite meals..I'll be trying this recipe soon. Oh, this looks so wonderful. I will bet it tastes as good as it looks. I made this for supper tonight and it was a HUGE hit - so tasty and good. Thanks for sharing - this is a definite keeper!